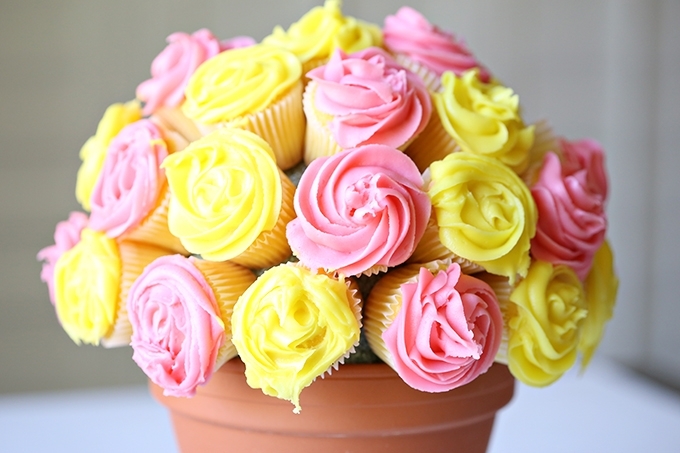 Spring is easily one of my favorite times of the year (probably because I’m a May baby and bias), and with flowers blooming, it’s the perfect time to make a flower pot bouquet — but out of cupcakes! It’s also a great idea for a DIY wedding or baby shower or "Any Day" gift idea. All you’ll need to get a Wilton 2D tip to create a flower, and you can easily find one of those at Michael’s or any craft store. Any frosting that’s not too runny will work, including store bought. You could even cheat and use boxed cake mix — I won’t tell, but I’m sharing an easy vanilla cupcake recipe. The flower pot would make a perfect centerpiece for bride-to-be or mom-to-be. You’ll also need: mini cupcake pan and liners, icing, piping bag, Wilton 2D tip, flower pot, styrofoam ball that fits inside pot, and toothpicks. Step 4: Fill piping bags with your frosting. Pipe a frosting rose on each cupcake using a Wilton 2D tip. Hold the piping bag perpendicular to the cupcake. Starting on the outside, squeeze the piping bag and create a spiral until your reach the middle of the cupcake. Step 5: ENJOY! No watering necessary!